Julianna Margulies stars as lawyer and mother Alicia Florrick in CBS' <em>The Good Wife</em>. First, a vocabulary lesson. In television, when a series focuses predominantly on medicine, crime, or the law, we call it a “procedural” show. It usually follows a case-of-the-week format: A crime must be solved, a case must be ruled upon, a surgery must be performed. These shows do well with audiences because cop, law, and hospital shows have predictable structures with self-contained episodes that can be run out of order and still enjoyed outside the context of the rest of the season. 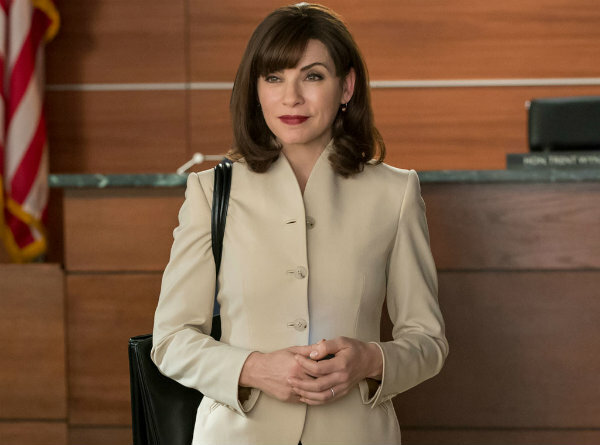 CBS’s The Good Wife is a legal drama in the most technical sense of the term. However, to dismiss the show as a “simply a procedural” would be to miss the point of the program entirely. There is nothing predictable about The Good Wife. Every episode must be watched in order to appreciate the meticulously crafted world, deeply flawed and compelling characters, and the complicated geometry of the ever-evolving relationships of the series. The show has a slam-dunk premise. Alicia Florrick (Julianna Margulies) is a lawyer who only practiced for a few years before becoming a stay-at-home mom. When her son and daughter are teenagers, her husband, Peter Florrick (Chris Noth), state’s attorney for Chicago’s Cook County, is sentenced to prison after being embroiled in a very public Eliot Spitzer–esque prostitution scandal. Alicia must become the breadwinner for her family, and so she returns to practicing law almost two decades after passing her bar exam. She goes to work for the firm Lockhart & Gardner, run by Diane Lockhart (Christine Baranski) and Alicia’s friend from law school (and once boyfriend) Will Gardner (Josh Charles). Almost immediately, Alicia is placed in direct competition with the only other first-year associate, young and hungry Cary Agos (Matt Czuchry). She also becomes fast friends with the firm’s cagey private investigator, Kalinda Sharma (Archie Panjabi). When I say the show is unpredictable, I’m not talking about the plot twists of the cases being solved. Though The Good Wife does a better job than any procedural I’ve ever seen of making the cases of the week compelling and relevant — tackled subjects include everything from Bitcoin to the Internet activist group Anonymous — it’s the characters and their relationships with each other that hold viewers rapt. Over the course of the show’s now five seasons, we have seen relationships shatter and mend, hated rivals become dear friends, and loved ones become unrecognizable strangers. The series does superior work capturing the intricacies and complexities of human interaction. You will not find a better set of relationships on currently airing television. And if we truly are in the golden age of TV, a time where we are being offered the best this medium has to offer, then it’s quite possible you won’t be able to find a better set of relationships in television history. The deftness with which The Good Wife explores the ethical gray areas of the law is only outmatched by the agility with which this show explores the gray areas of human behavior.